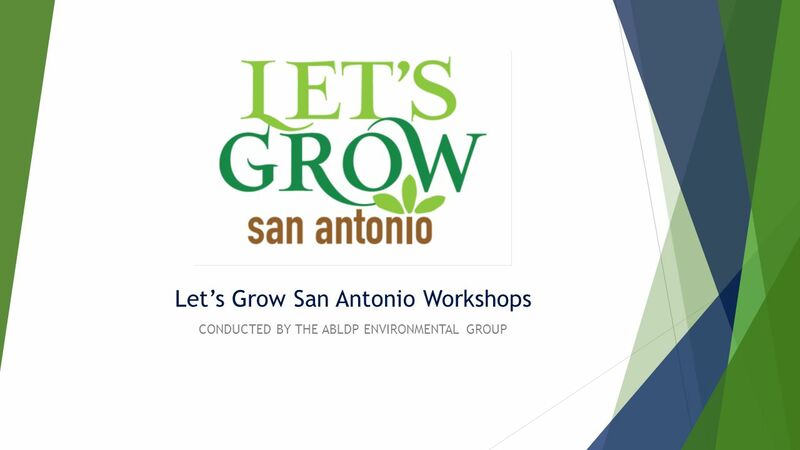 Let’s Grow San Antonio Workshops CONDUCTED BY THE ABLDP ENVIRONMENTAL GROUP. 3 PURPOSE AND NEED Why are we doing this? What is the point of the workshops? 2.LACK OF KNOWLEDGE—A large reason why people don’t garden is due to lack of information. 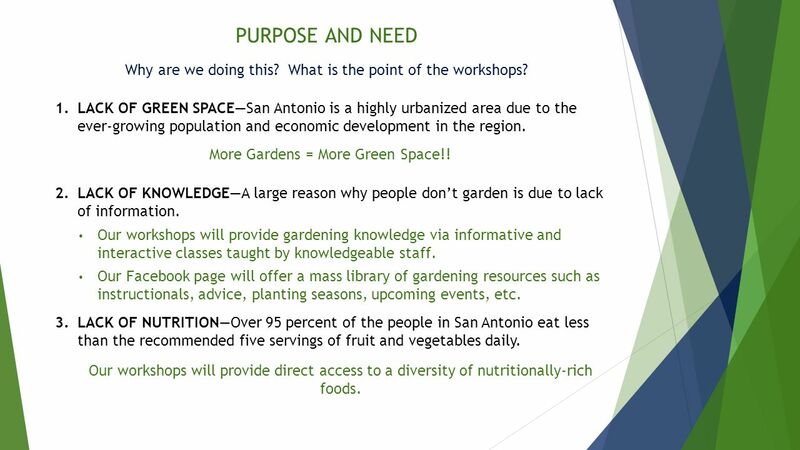 3.LACK OF NUTRITION—Over 95 percent of the people in San Antonio eat less than the recommended five servings of fruit and vegetables daily. 1.LACK OF GREEN SPACE—San Antonio is a highly urbanized area due to the ever-growing population and economic development in the region. More Gardens = More Green Space!! 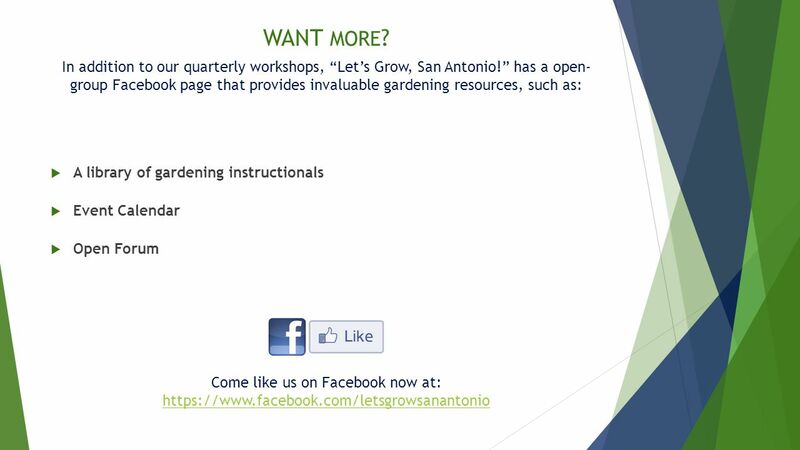 Our workshops will provide gardening knowledge via informative and interactive classes taught by knowledgeable staff. Our Facebook page will offer a mass library of gardening resources such as instructionals, advice, planting seasons, upcoming events, etc. Our workshops will provide direct access to a diversity of nutritionally-rich foods. 4 LET’S HEAR THE DETAILS!! 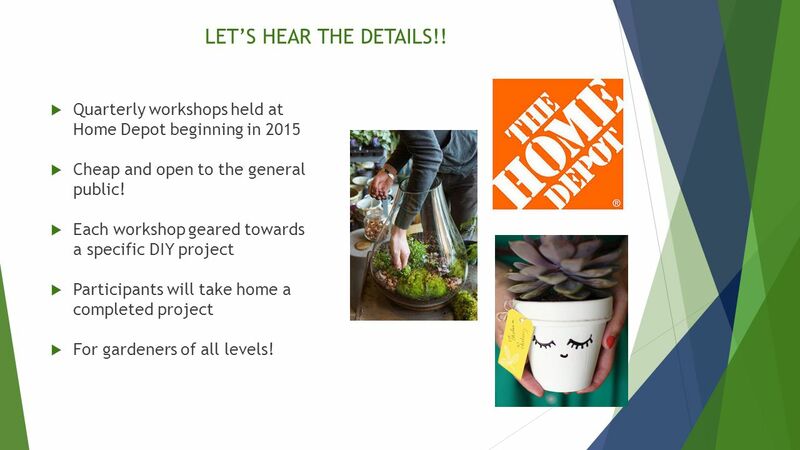  Quarterly workshops held at Home Depot beginning in 2015  Cheap and open to the general public! 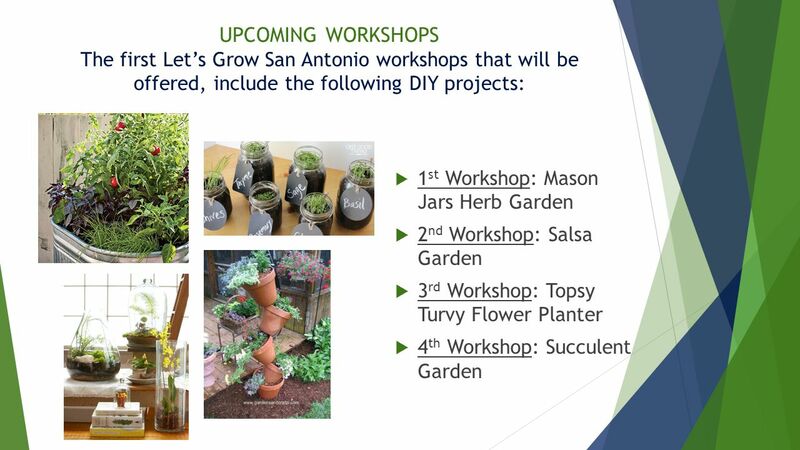  Each workshop geared towards a specific DIY project  Participants will take home a completed project  For gardeners of all levels! 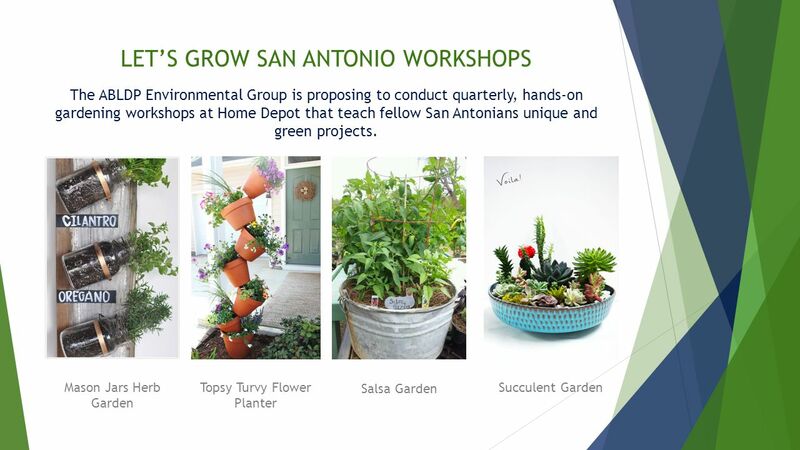 Download ppt "Let’s Grow San Antonio Workshops CONDUCTED BY THE ABLDP ENVIRONMENTAL GROUP." Student Organic Farm at the University of Idaho. Who are the Soil Stewards? University of Idaho Students Committed to Organic Farming & Sustainable Community. The Importance of Honey Bees. Why do you think honey bees are important? Fall classes, 3 internships, 5 community initiatives, and12 student organizations showcased their community projects. Thank you so much for participating. Lesson 2: How Does Your Garden Grow? The Future of Farming. Cap-Net UNDP Virtual Campus May 31, 2013 Damian Indij. RiversideCa.gov Nutrition Education and Obesity Prevention Branch Let’s Get Energized: Reach for the sky Wrist circles Ankle circles Gentle neck stretches. Look Windwards! A Question of Bananas Copyright © 2006 Farming and Countryside Education. Get Fit, Eat Right, Grow Strong: Starfinder Foundation’s Fitness and Nutrition Program Spring 2012 Pretest Starfinder Foundation. Empowerment Knowledge and Skills + Implementation Empowering People. Community and School Gardens Growing Healthy Communities. Nutrition Education for Young Adults with Developmental Disabilities Christina Turner University of Connecticut Master of Public Health Candidate. Growing our Future Connecting to Life A Project funded by the National VET e-learning Strategy. Peace Corps Dominican Republic Special Education. Cooking with Seniors & Urban Garden. Cooking Classes  The new Atrium Kitchen offers a variety of classes and resources for the downtown community to. My Rationale Miss L. Reid. Importance of PD/H/PE in Schools Promotes an active and balanced lifestyle. Educates students about their health and well being.